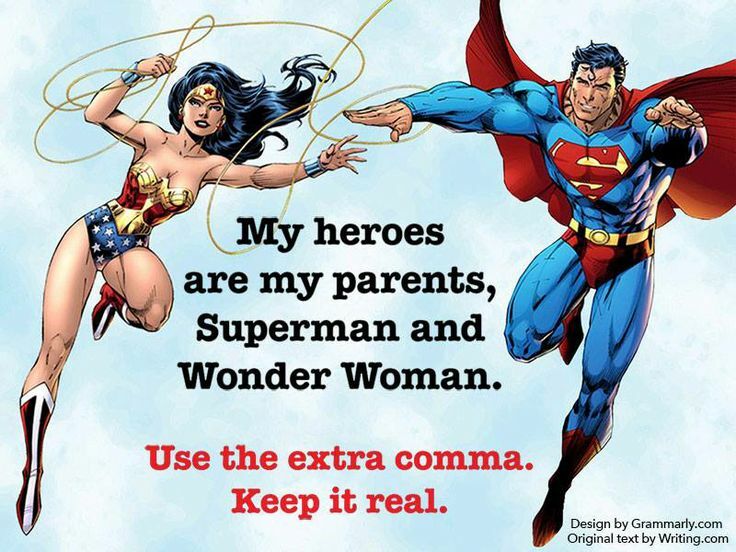 Commas are important, including the Oxford Comma. The Oxford Comma (or the Serial Comma) is the comma before “and” in a list of three or more items. For example: Violence, housing and retail segregation, and limited opportunities were still present but were very different in nature. The comma between “segregation” and “and limited” is the Oxford Comma. While some people say the Oxford Comma is optional or even wrong (and newspapers, sadly, refuse to use it), this comma is important for providing clarity, regardless of the sentence. Additionally, grammar books say to use it. Consider how different and potentially confusing the sentence would be if it were: Violence, housing and retail segregation and limited opportunities were still present but were very different in nature. Even in more “simple” sentences—such as: Classized, racialized, and genderized issues were involved—the Oxford Comma is useful. Writing should always be about clarity. 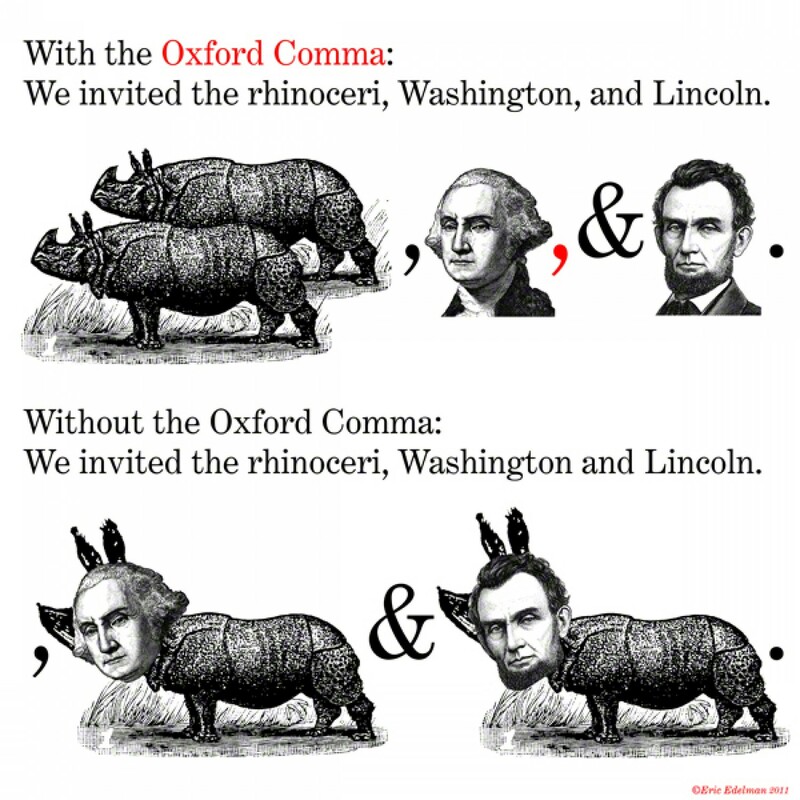 The Oxford Comma helps be sure readers and writers know which ideas go together. These students say electronic courses enable them to enroll and earn degrees. In Utopia, everyone works equally, and everyone works in an occupation of his/her choice. Castro had defeated Fulgencio Batista’s regime, and he replaced it with his own regime. Russell provides an interesting and revealing account, but his arguments would be better and more accurate if supported by additional examples and numerical analysis. Use a comma between all items in a series of three or more things. The final comma is called the Oxford Comma. Do not place a comma after the last item. Both existing schools and newly created schools were reorganized under a free educational system. Because of the United States embargo, however, schools occasionally had trouble acquiring necessary supplies, such as crayons and paper. He sent the urban literate to the illiterate, rural, and disadvantaged. Individuals could take sentences such as this one (and countless others), ignore the context and actual meaning, and support a variety of potentially destructive ideologies. Perhaps the way Sir Thomas More and William Shakespeare present slow, subtle, and contradictory change works best to start the chain of events in diminutive steps. Use a comma after introductory phrases. For this aspect of his life, he is presented as literally no more than a product of society, even though this element of society is not discussed. Historically, tensions have existed between the Cuban government and the Catholic Church. Generally regarded as the first scholar of slavery and as a racist scholar, Ulrich B. Phillips (1918) argues that slavery was a paternalistic association that benefited and worked toward “civilizing” African-Americans. Use a comma to set off a nonessential clause, as in appositives. Do not use a comma for essential information. This creates a connotation carried into society that college enrollment is increasing, but as Jonathan Zophy, Professor of European History, points out, overall enrollment in college classes has not been increasing. Because its authors derive an estimated ninety-five percent of their information solely from Johnson’s diary, which he kept from 1835 to 1851, The Barber of Natchez is limited in its effectiveness, as it lacks analysis, contextualization, definitions, and explanations. This pseudoscience, then, allowed men to justify their elite existence and to explain why women, “savages,” and substandard European men deserved to be written off as inferior. Studying Gone with the Wind, therefore, involves tensions and differences that were much more firmly established in the national consciousness than in just the Civil War and post-Civil War eras. Because each effort to achieve independence or each revolutionary uprising only produced new tyrants, ultimately, such countries were stillborn, as they failed to achieve true freedom or stability. After detailing throughout her monograph, for example, how men categorized women as being both “children” and “savages,” she concludes in her last paragraph that men were literally no more than products of society, thus denying them any and all agency. In 2008, on the other hand, Hillary Rodham Clinton (1947- ) became the first woman who almost received the presidential nomination from a major political party. According to Victorian science, women, as they had been for centuries, were to be mothers, not laborers or thinkers. Both Utopia and The Tempest have androgynous authors who create worlds dramatically different for everyone, worlds isolated in the protection of islands. Use a comma with dates and places. Please note a comma is required after the day and year (as in example “a”) and after the city and state (as in example “b”). Oliver Brown et al. vs. Board of Education of Topeka et al., the United States Supreme Court’s historic decision on May 17, 1954, had profound consequences for African-Americans. In actuality, Gone with the Wind with the one exception in Atlanta, Georgia, does not focus on the horrors of war. In 2004, Clotfelter argued that Milliken vs. Bradley (1974) was the turning point, halting any possible efforts toward achieving complete desegregation. (Note: in the United States, always use “toward” not “towards”). Use a comma with numbers. Note: in most cases, numbers that can be spelled with two words or less should not be typed out. Most importantly, be consistent. In 1860, there were also 262,000 free Blacks in the South. To contemporaries in the twenty-first century this seems mind boggling, but during the Great Depression, ten cents was worth a fight. Use a comma in “backward” sentences. By focusing on Brown’s progress and debunking demands that call for complete and quick enforcement, Sabrina Zirkel and Nancy Cantor help readers reach a new understanding. Use a comma between coordinate adjectives not joined with and. Using this yet another semester. Lost my “copy” when my teaching goodies folder was wiped out in the changeover, but I was able to navigate your website and retrieve way for the students to “access” it from the website–techkie me!